The Church of Jesus Christ of Latter-day Saints, often inadvertently called the Mormon Church, has established a new stake in Armenia. 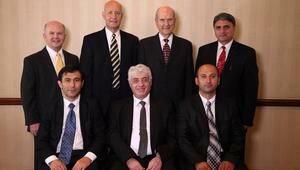 Armenia Stake Presidency: Sitting, from left to right, first counselor Varuzhan Poghosyan, stake president Hovik Hovhanisyan, second counselor Arthur Sargsyan.Standing, from left to right, Yerevan Armenia Mission president Reese A. Carter, Area Presidency counselor Elder Per G. Malm, Elder Russell M. Nelson and Elder Araik Minasyan of the Seventy© 2013 by Intellectual Reserve, Inc. All rights reserved. On 16 June 2013, Mormon leaders established the first "stake" (similar to a diocese, a group of administered congregations) in The Republic of Armenia. Elder Russell M. Nelson of the Church’s Quorum of the Twelve Apostles was joined by Elder Per G. Malm and Elder Araik Minasyan of the Seventy to form the stake in a special meeting with members and newly called local leaders in the capital city of Yerevan. The Republic of Armenia declared independence from the Soviet Union in 1990. A year later the Soviet Union was dissolved, and in 1992 two people were baptized as the first members of the Church in the newly formed country. When a small number of Mormons meet together, they are called a "group." When there are enough men in the group who hold the priesthood and can administer the congregation, the congregation is large enough and strong enough to become a "branch." A fully-functional congregation is called a "ward," and a ward may have 200 to 1000 members. When there are enough wards in an area, a stake is formed. The new stake in Armenia brings the total number in the Church worldwide to 3,025. The Church also launched the new Armenia Mormon Newsroom website. Get more information about Elder Nelson and the creation of the first stake by visiting this site. This page was last edited on 24 June 2013, at 15:10.